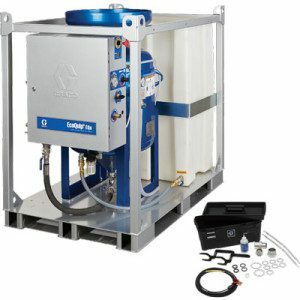 The pump used is engineered for our Vapor Blast systems – other OEM’s use no pump or one that’s off the shelf and not designed for vapor blasting environments. The Texas-born Dustless Blasters don’t have a integrated pump OR water tank. Our EQp model comes with a garden hose connection allowing for a continuous supply of water – no refilling required throughout the day. Working in a remote area? No problem – our equipment can also siphon water from a standalone water tank or check out our H2O To Go accessory. We have many stories of when our equipment performed better than others – if you are in the market for a vapor/dustless blasting system, make sure you talk to us first as we can help you make an informed decision and ensure you invest your money wisely and do not have any ” post-sale” regrets. We have been in business since 1984 – our focus is “all things blasting” and helping our customers wherever and whenever they need it. Please contact us now for further information and pricing. Have you ever seen what it takes to empty a “Texas-born” Dustless Blaster? They actually recommend just blasting out the leftover media if you are in a hurry (that gets expensive and messy very quickly! ), and if you have more time then you need to disassemble the bottom valve assembly using tools (very time consuming). Our systems use a simple clamp on the bottom of the vessel that can be undone with no tools. This is critical – in today’s world of blasting, no two jobs are the same. Although today you may have only needed to use crushed glass, tomorrow’s job may require something harder like Jet-Mag. The EQp unit has the ability to quickly empty the vessel and easily contain the leftover media as it drains out. You would expect all OEM’s to coat the inside of the vessel, especially since it is in constant contact with water and abrasive. Well………believe it or not, some don’t. Our machines use an advanced 2 coat system that fully protects your investment inside and out, ensuring a long life and low maintenance operation.